Shrubby cinquefoil ‘Abbotswood’, or as it is commonly called, potentilla ‘Abbotswood’, is a profusely flowering deciduous cultivar of potentilla. Potentilla fruticosa ‘Abbotswood’ – to use its full name – is an excellent choice to add some colour to the summer garden, which has made it quite popular among garden owners. In fact, its flowering period may start as early as April and will last well into September, which implies that this outstanding shrub is able to create a lovely display for the better part of the year. The lance shaped, (pinnate) pale green leaves – which turn coppery orange in autumn – provide a lovely backdrop for the unlimited supply of very shapely, brilliant white flowers for the duration of the flowering season. As a bonus, this striking deciduous shrub is remarkably easy to maintain. When grown as an informal hedge, shrubby cinquefoil ‘Abbotswood’ does not need to be trimmed or pruned. It can simply be left alone, as it won’t grow any taller than approximately 75-100cm in height and will not lose its shape either. Should you require a neat hedge for a very tidy garden, pruning will allow you to shape it as you like, but it is certainly not a requirement. 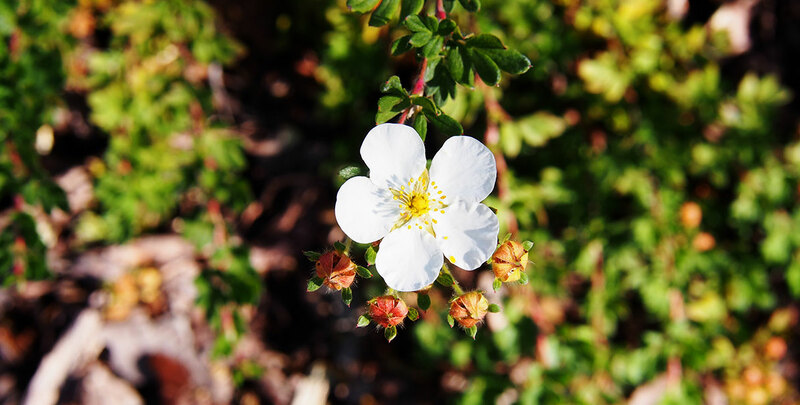 In case you decide to prune your potentilla ‘Abbotswood’, there is nothing in particular you need to keep in mind – it will recover from almost anything you do to it. Also, you don’t need to prune it particularly often to keep it in shape (less than once a year), as this easy to maintain shrub grows at an average of only 10-15cm p.a. In addition to being conveniently undemanding, potentilla ‘Abbotswood’ will accept almost any soil, provided it is well-drained. It is happy growing in a sunny position or in partial shade. Avoid planting your shrubby cinquefoil in a location where it receives very little sunlight. This does not imply that potentilla ‘Abbotswood’ will have difficulties surviving the winter: potentillas are tough plants that can deal with a wide range of challenging conditions, including frost. It makes a great addition to any garden, border or public park.